Panic Proof Keyed Entry Mortise Lock from the Locksets Collection. Omnia s locksets with solid brass trim are the locks of choice when optimum security and stunning design are the objective. An extensive range of knob and lever styles are available. 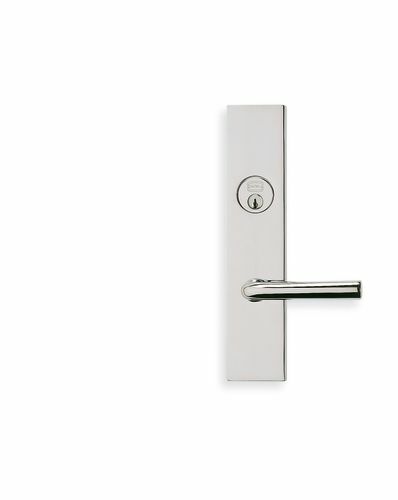 Built to withstand heavy use, our commercial grade, UL listed, fire rated, mortise locks combine precision engineering for security and durability with attractive designs. All of our mortise locks are designed for use with heavy brass knobs or levers, with special springing provided on lever sets. A special rose assembly is bolted through the locks, and backplates feature a unique inside-to-outside mounting. Latchbolt operates by knob or lever from either side except when outside trim is locked by stop button. Deadbolt activated by key outside and turnpiece inside. Turning of inside knob or lever will retract both deadbolt and latchbolt at the same time. Available in 2-1/2" or 2-3/4" backset. Heavy wrought steel case with zinc dichromate finish for corrosion resistance. Adjustable armored steel front with 8" and 1-1/4" solid brass faceplate for all lock bodies.